I managed to get a picture taken and edited before I leave! I don’t know if I’ll keep up with what I have been doing…I’ll try but the computer back in Ohio is SO slow and annoying. We’ll see! I also plan on taking pictures on the train…hopefully I’ll have the guts to do it. If so I’ll post some for you to see. This is practically my first time on a train and I’m excited (though I know it’s going to be a long 7 hours)! I meant to put a sky in my mouth today but it didn’t work…oh well, still much blue for you to enjoy lol I’ll try putting the sky in my mouth some other time! PS. I’m becoming obsessed with eye make up on GIMP…I LOVE doing it!! so lovely and great expression. I saw this about five mintues ago, but with no comment underneath. I thought I’d wait a bit. Have a lovely safe trip back. Hope you survive the 7 hours without wanting to pull your hair out. You’d never guess this was a webcam Kat! It’s beautiful. 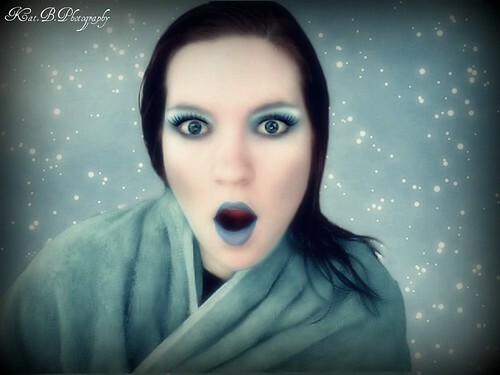 Love the make-up and the look on your face, you look shocked – not sure if that was your intention, but I like it! Todas las cosas son hermosas a los ojos sinceros. have fun on the train and in ohio! love the colors here girl!! You are so good at this, it is insane! This is awesome! Great colors. This is a great picture. And you’re doing great with the virtual make-up! Nice softness and beautiful pic. Hi, I’m an admin for a group called Shocking, Surprise and General Wide Eyes! !, and we’d love to have this added to the group!